delicious wife: dry rub for beef, chicken, or pork! dry rub for beef, chicken, or pork! is your chicken boring? are you tired of the same old feeling? do you want to tickle your taste buds? you might be ready to add a dry rub to your repertoire! it's so easy, and i bet you have the ingredients in your kitchen. 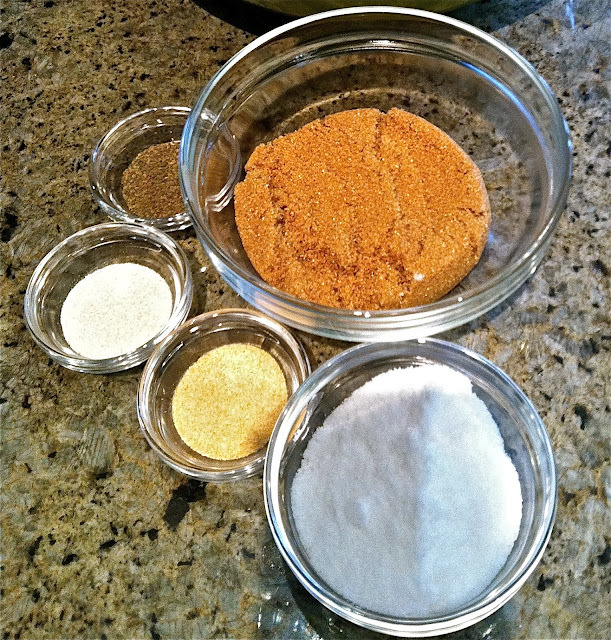 a dry rub is a mixture of spices and/or herbs that's rubbed onto beef, chicken, or pork. it can take your dinner from "oh" to "oh my goodness"! the dry rub creates a tasty "crust" that infuses the meat with delicious flavor and gives it beautiful color. the best method to cooking foods with dry rubs is dry heat. oven roasting, grilling, and smoking are perfect! this dry rub recipe is my favorite for chicken. i also use it for pork. you can substitute the herb de provence for which ever herbs you like...rosemary and thyme is a good combo! or, you can leave them out completely. brown sugar help the chicken to caramelize, and adds that yummy flavor you can't quite put your finger on...it's sugar! i usually start by brining the chicken...a step you can skip. but, i highly recommend you read this, so you can learn a thing or two about the wonders of brining. in a small bowl, mix all ingredients. begin by allowing your chicken to come to room temperature. rinse and thoroughly pat dry. rub a tablespoon of the dry rub all over...and work it in. get it under the skin and throw some inside the bird, too! let is sit for a minimum of 30 minutes. if you have the time, give it an hour or two, so the meat absorbs the spices and essential oils from the herbs. then, roast it, grill it, or smoke it. i personally LOVE, LOVE, LOVE smoked chicken! did you like this post? leave me a comment or share with the links below!